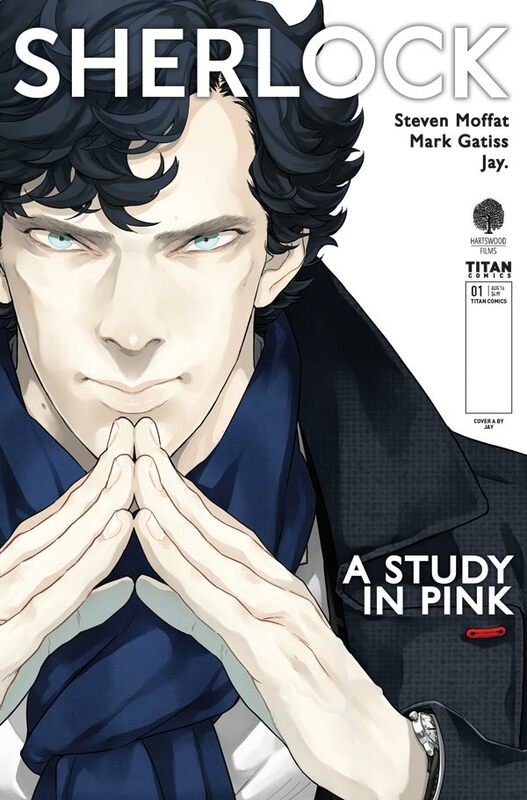 The Japanese SHERLOCK Manga comes to the USA and UK for the first time ever! 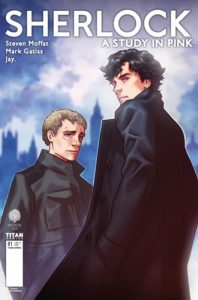 Adapting the episodes of the smash-hit BBC America/Hartswood Films TV show that sees Sherlock (Benedict Cumberbatch) and Watson (Martin Freeman) tackling brain-teasing crimes in modern-day London, this stunning manga is presented in its original right-to-left reading order, and in the full chapters as originally serialised. Each oversized issue comes with a selection of BRAND-NEW covers by some of the best Sherlock artists around! #1 kicks things off with a 52pp special. 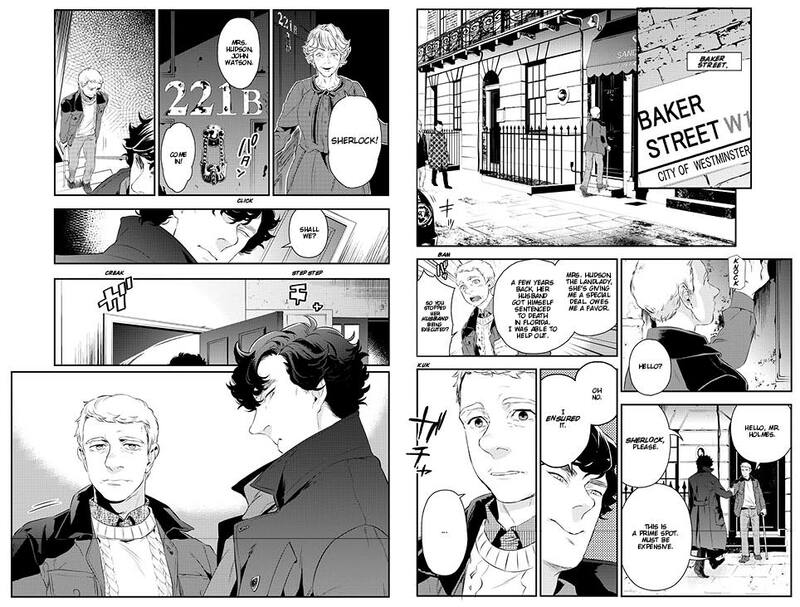 Meet Sherlock and Watson for the first time… all over again! Detective Investigator Lestrade has a couple problems. A series of apparent suicides, at first glance completely unrelated, but of very similar circumstances. A media frenzy having a fit over the idea of “serial suicides”. And one know it all who seems to take great pleasure in publicly pointing out his every mistake. When you’ve eliminated the impossible, when all you have left is the extremely improbable, where do you turn? 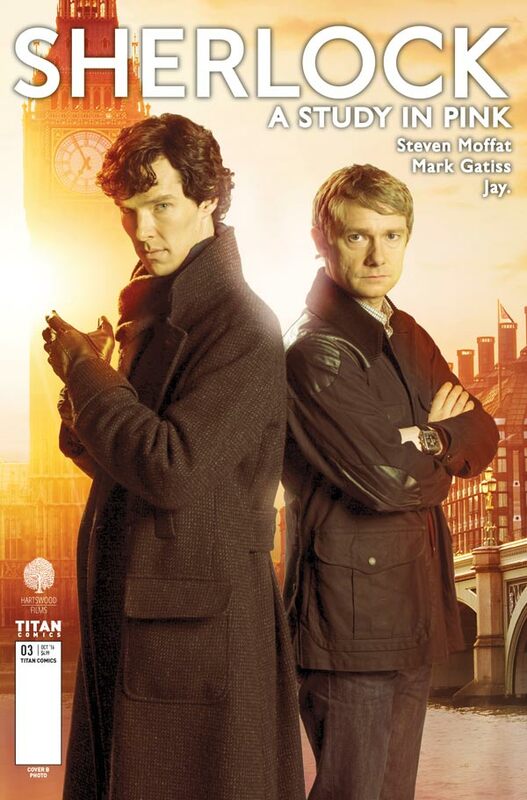 That’s an easy one… you turn right to the sadistic know it all, one Sherlock Holmes of 221B Baker Street. Sherlock Holmes has a couple problems. First and foremost is his narcissistic inability to comprehend any circumstance in which he might not be the smartest person in the room. While he fully, some might think a little too proudly, admits to being a high functioning sociopath, he refuses to see this as anything resembling a “problem”. What he does recognize is the fact that he can’t afford a decent flat in London by himself. Enter one Dr. John Watson, a disabled veteran of the war in Afghanistan, and also looking for a decent yet affordable place to stay. At first glance one could be led to believe that this is a perfect match. 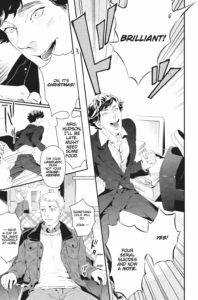 Dr. Watson, a man of science, should be the perfect roommate for someone as analytical and detail oriented as Sherlock Holmes. But if everything were judged on surface appearances alone, this would be a very boring book. And I can tell you with some degree of enthusiasm that it’s not. What it is is a pretty fine adaptation of the first episode of the BBC series Sherlock (which was in turn adapted from the book “A Study in Scarlet” by Sir Arthur Conan Doyle), in the manga style. Now let me just take a minute to fill the uninitiated in on what that means… Manga, as a genre of comic books has a few very distinct characteristics. While in this instance, the character designs are fairly straightforward, there are still the overly large eyes, the expressive word bubbles indicating the mood of the speaker, and single drops of sweat on the brow of a character feeling worried. More important than all of that, and probably the most useful as it can serve as a bit of needed advice before you start reading the comic, is the fact that the panels don’t read from left to right, but rather right to left in keeping with the Japanese language itself. Thankfully, Titan Comics made some allowances for Western readers and didn’t print the book in the Japanese style, from back to front. Fans of Japanese Manga will know exactly what I’m talking about. Now, I’m going to address fans of the BBC show, Sherlock, by assuring you that every element of the show that you love is present in this book. The artists and writers for the book have lovingly and painstakingly rendered some of the best moments in the show for your reading pleasure. So much so, in fact, that I almost had to wonder if a fan of the show would want to bother with the comic. And then I read the comic, and my doubts were pretty well eliminated. I am a fan of the show, a fan of Sir Arthur Conan Doyle’s stories, a fan of Sherlock Holmes in general. I think he’s an outstandingly, dynamically flawed character who overcomes every problem by dissecting it to its core. Holmes is the embodiment of mind over matter. As for his soon-to-be partner, Dr. Watson, I can also assure you that he’s been given much better treatment in recent days than he was in Doyle’s original works. For the most part, Watson was generally treated as Holmes’s straight man. Perhaps not so much a flunky, but still never Holmes’s equal in any respect. In the more current incarnations of the works, Watson is Holmes’s grounding influence. Both characters are given a much more layered treatment these days, and it’s made clear that in social situations Holmes is all but dysfunctional. Watson is his anchor, and each without the other is a broken mess. On the part of Watson, the story catches up with him still in the process of recovering from PTSD (Post Traumatic Stress Disorder). As an Army doctor working on the front lines in Afghanistan, Watson has seen more than his fair share of horrors and traumatic events. On top of that, being shot and left with a limp calling for the use of a cane, and Watson is left with the dilemma facing combat veterans, mainly that of returning to a “normal” civilian life. Unfortunately, one of the things that makes this transition so difficult is in the swing from one end of the spectrum, where the activity is fierce and the individual is vital, to the other where the day to day is decidedly less stimulating. In the case of a disabled veteran, you can add to that the feeling of being less than useful, less vital, shuffled to the side so as to be “out of the way”. That two individuals who, on the surface, couldn’t be more different are able to kick off a mutually beneficial friendship is the dynamic that makes it all work. 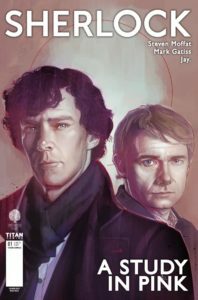 Where Watson brings a sense of humanity to Sherlock’s life, Sherlock in turn brings Watson to a place where there is some pretty frenetic activity, where he isn’t thought of or treated like damaged goods, and where his mind can once again be used for something stimulating and useful. In the strictest sense, when their powers combine they become something unstoppable and, for fans, eminently entertaining. All of this, more than anything else, maybe even more than outstanding performances from Benedict Cumberbatch and Martin Freeman, is what makes the BBC television show so successful. These are also the things that are hinted at in this first issue of the comic book series. Titan Comics brings to the page every snide expression, every character dynamic, and every look of joyful relief at a prospective puzzle to be solved. This first issue has barely cracked the surface, but it absolutely shows hints of that greatness. It should appeal to fans, old and new… but you won’t know that until you check it out for yourself. And isn’t “knowing” what it’s all about?